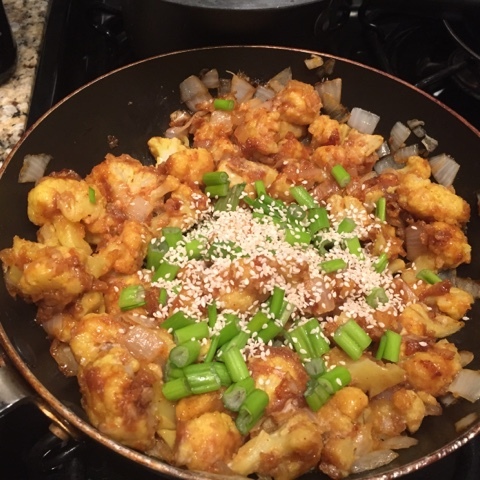 I love ordering the popular Indo-Chinese dish gobi manchurian at restaurants, so decided to try to make some at home. 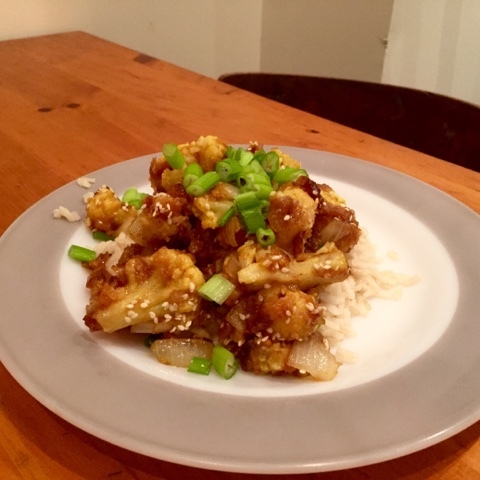 Here is my version of the fried cauliflower dish - I found a couple of recipes online which I used as general guidelines, and then adapted based on the ingredients I had at home. 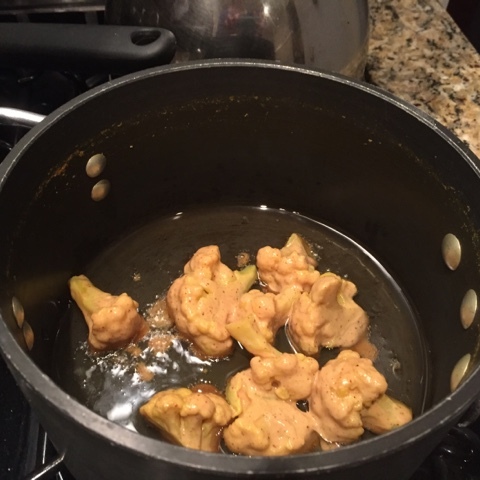 Bring a pot of water to boil with salt and turmeric stirred in. 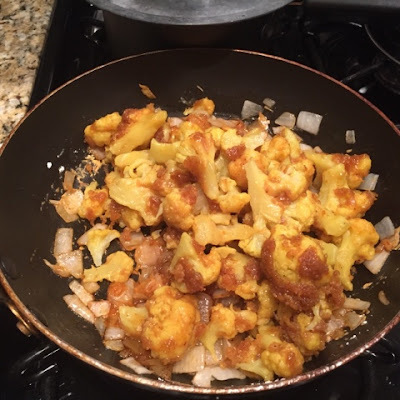 Add cauliflower and cook until tender. 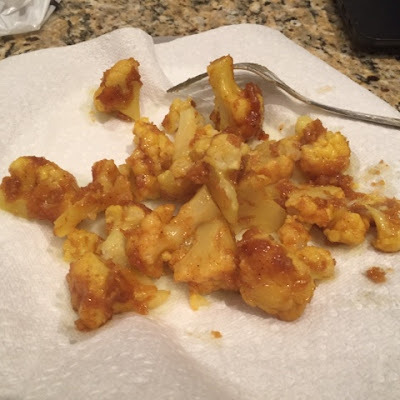 When cauliflower is cooked, drain and set aside. 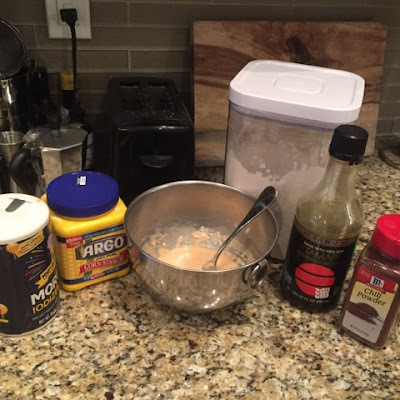 Make batter by mixing together about a 1/2 cup of flour, a 1/4 cup of cornstarch, a teaspoon of soy sauce, a teaspoon of chili powder, a clove of crushed garlic, salt to taste, and enough water to make a medium thick batter. 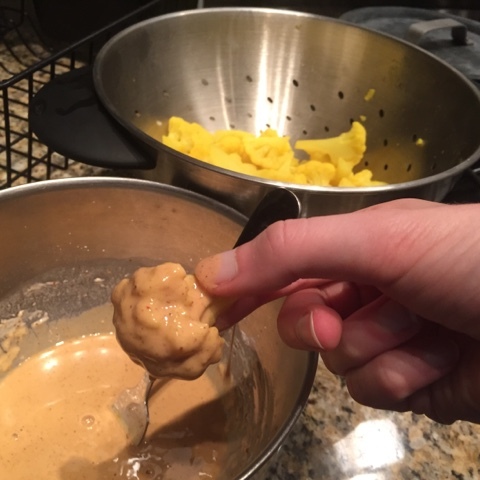 Dip the cauliflower in the batter to completely coat. 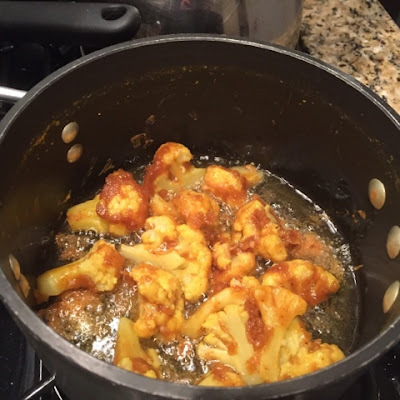 Heat up oil in a pan, and add battered cauliflower. When cauliflower is cooked on one side, flip over and cook the other side. Put cauliflower on a paper towel to dry when completely cooked. 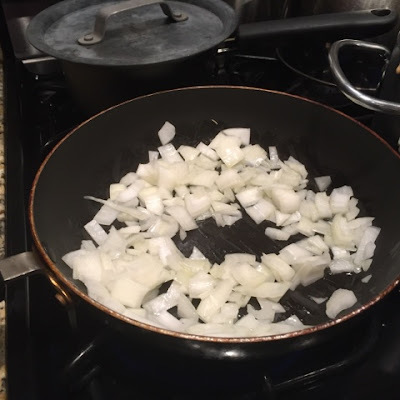 Meanwhile, heat up oil in a frying pan and add half of a chopped onion. Add a teaspoon of salt, a teaspoon of sugar, and a clove of crushed garlic. Cook until onion starts to brown, then add a little soy sauce and rice vinegar to taste. 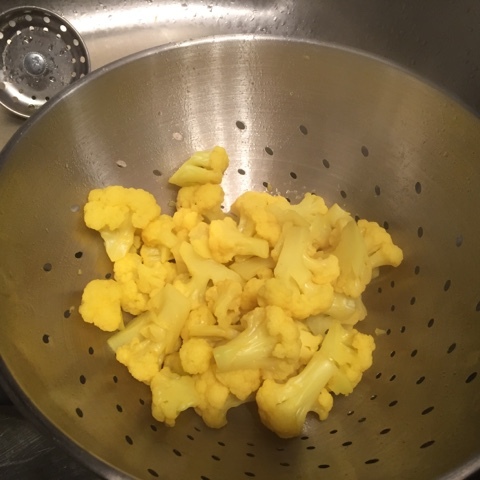 Add the cooked cauliflower to the pan, and pour on a small amount of cornstarch mixed with water to thicken the dish. Cook for a few minutes. Finally, add some chopped scallions and sesame seeds. Mix everything together. Serve over a bed of rice. Enjoy! Wow! I had the ingredients on hand and made this last night, and it is delicious! 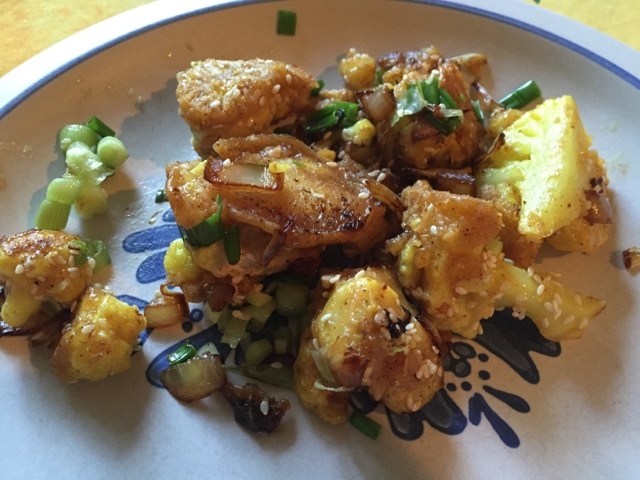 I used coconut oil for the frying and was able to fry at a fairly high temp without burning. It wasn't greasy, so I omitted the paper towel step. 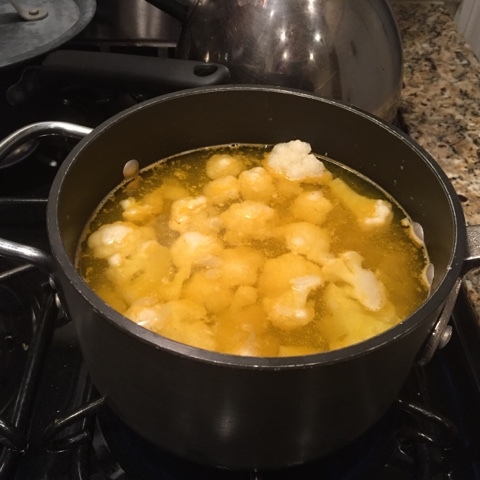 The entire dinner took about half an hour - I started the onions while the cauliflower was boiling. I served it with a side of lentils.